Disney’s The Lion King is my favorite movie. In my opinion, it was one of the most realistic in showing real-life scenarios in animated form. All relatives don’t get along, parents pass away too soon, and sometimes you have to remove yourself from it all for it to make sense. Yet, there is always someone that pops up to remind you who you are and what you left behind and why you should go back. We’ve been hearing about the live-action remake of the classic for what seems like forever. If you and your family were anywhere near a television yesterday, you saw the trailer an got all the feels. The remake will have actors and actresses we’ve seen before and some we’re being introduced to for the first time. James Earl Jones returns as the voice of Mufasa (because if not him, who else? 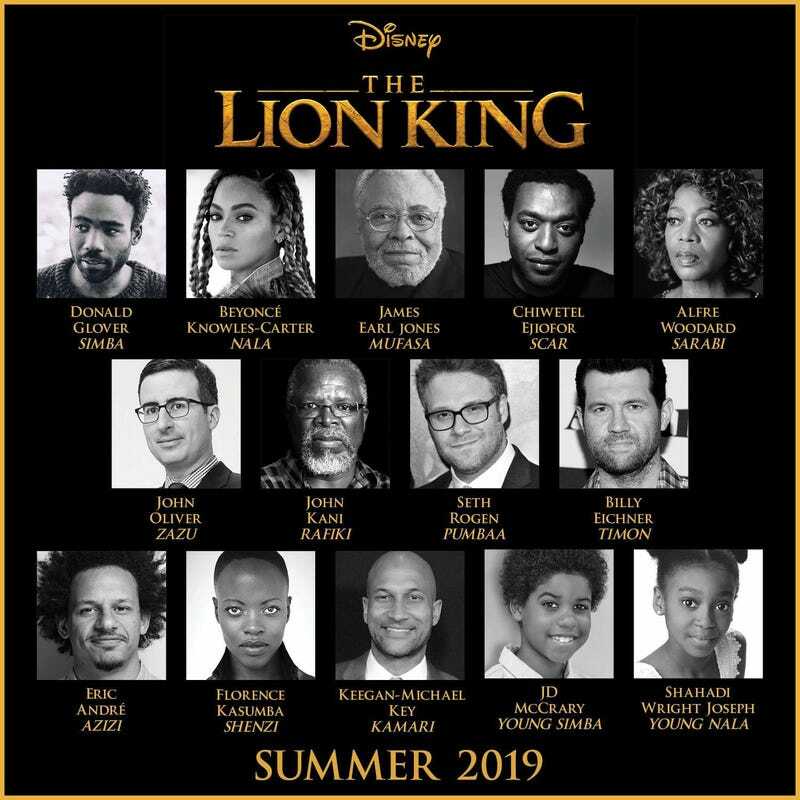 ), Alfre Woodard as Sarabi, Donald Glover as Simba, Beyonce as Nala, and are those some Wakandan crossovers? Why, yes! John Kani, who played King T’Chaka in Black Panther will voice the wisecracking Rafiki, and Dora Milaje alum, Florence Kasumba, will voice Shenzi, the lone female hyena originally voiced by Whoopi Goldberg in the animated version. Take a look above to see what other faces will be behind the voices of the iconic characters we will see on the silver screen next summer. Click the link below to watch the trailer if you didn’t catch it or if you want to wat it again.